Made in the USA at affordable prices. Crafted from the highest quality seamless yellow brass. We can ship to Europe and Canada as well! Fabien's sound protocol for the Chakras. After more than 7 years' research Fabien Maman developed the now famous system of using "The Cycle of Fifths" (starting with low F) instead of a diatonic scale (C,D,E etc) to empower and energize the chakras. The low F corresponds with the vibration of the circumference of the earth. The fifth interval between notes is the most empowering and expanding of all notes in Classical music tradition. 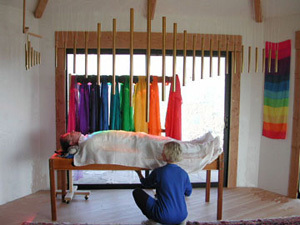 Fabien developed the TEP Chakra Tubes® specifically for his TEP technique, which harmonizes the chakras. The TEP Chakra Tubes consist of 8 sound tubes made from instrument-grade brass starting with the note for the root chakra and progressing up to the crown. For those interested in purchasing the TEP Chakra Tubes® with the F and E Overtones, we ask that you be trained in our Tama-Do sound protocol first. We require that you become a Certified Tama-Do Practitioner before purchasing these tubes. Fabien Maman developed the F Overtone scale to ground the Root Chakra. Studies have shown that low F is the vibrational frequency of the circumference of the earth. With 15 sound tubes, the F Overtone Scale works to stretch the energy from the first chakra down to the earth, as it expands consciousness in the energy field. It is the perfect complement to the TEP Chakra Tubes®, grounding the client after they have been expanded and energized. With 9 sound tubes, the E Overtone Scale® works to clear the energy around the head, opening the third eye, crown chakra and Bindu. It reharmonizes in a very fine way the first 3 auras of the head. The full TEP Set with F and E Overtones is the perfect combination of sound to reharmonize sky and earth energy around the body.